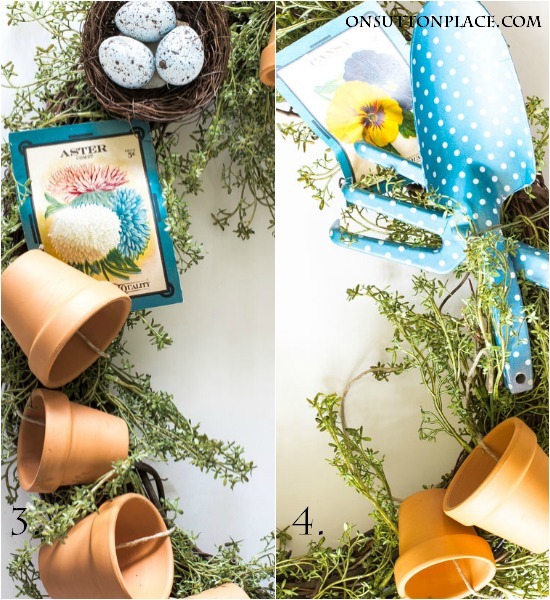 Easy tutorial for a diy summer garden wreath with pictures. 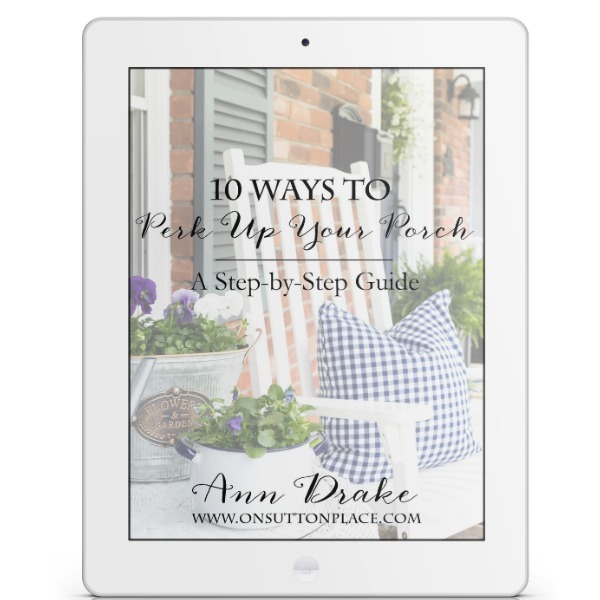 Includes how to attach the terra cotta flower pots. Perfect for your summer front porch! OK…ready or not, we are moving on to what’s ahead. Warm weather, sunny skies, dirt under our fingernails and time spent outside. I decided to just forge ahead and pretend that there isn’t snow on the ground! I am determined to get my front porch cleaned up and hope to share that with you in the next week or so. 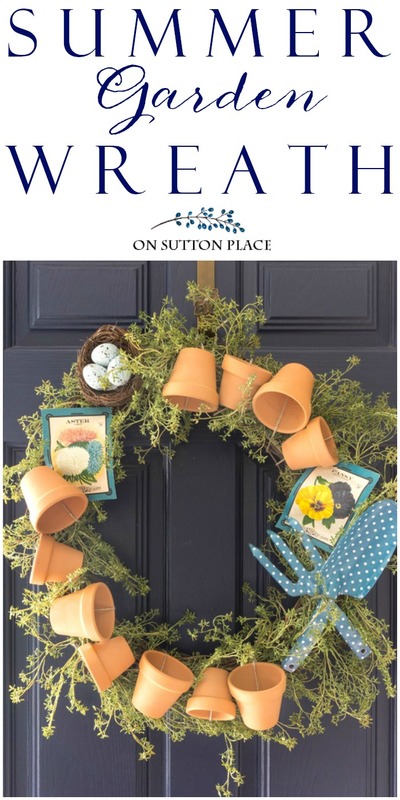 Today we’re starting with the front door and a DIY Summer Garden Wreath. I have seen these on Pinterest for a few years and always loved them. I thought they might be a little complicated and time-consuming, but proved myself wrong on that. This project was fun, simple to do and affordable. Let’s get on with it! 1. 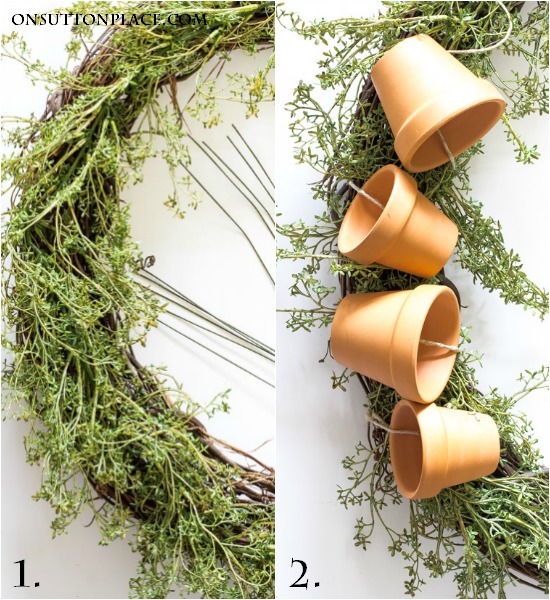 First thing to do is wire your greenery garland onto the wreath in about 4 places. When the greenery is attached, place your embellishments on the wreath so you can see what you are doing…sort of a dry run. When you have everything where you like it, move on to step 2. 2. 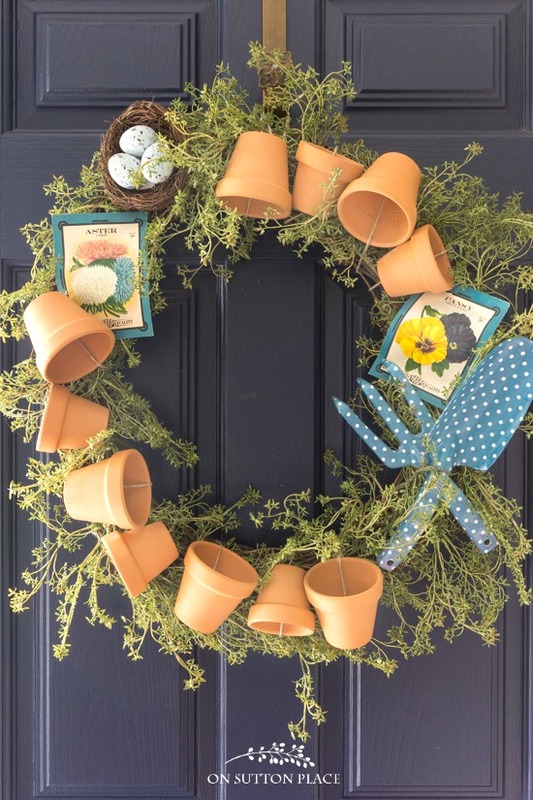 Cut a long piece of twine and start attaching the little terra cotta pots, putting the twine through the bottom holes and wrapping it around the wreath. Make sure to knot the twine well so it doesn’t slip. Another option would be to tie on the pots individually. I did that at the end and it was just as easy and quick as wrapping the twine. 3. Use a hot glue gun to attach seed packets. 4. Use wire to attach your other embellishments. 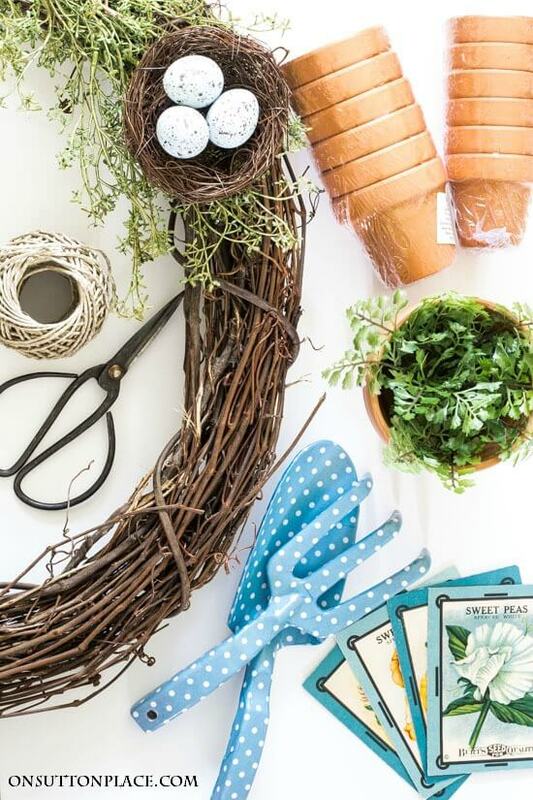 This DIY summer garden wreath is a bit heavy so be sure to double up twine or florist wire to make a sturdy hanger. I’ve put together a list of sources below. Some are not the exact item that I used but I tried to get as close as possible. I got everything I needed during one trip to Hobby Lobby, with the exception of the vintage seed packets. I found those on Etsy. Other suggestions would be The Dollar Tree or other craft stores (like Michael’s.) From start to finish it took about 2 hours…but that included taking all the pictures. The total cost of my wreath ended up at just under $35.00. I bought a new grapevine wreath but you could save a little if you recycled one you already have. I know that if you purchased a wreath like this at a craft show or retail shop it would be three times the price of this one. Plus…you can say you made it yourself. Go ahead…brag a little! Like I said at the top, I’ll be back with my front porch but I’m not sure when. I hope you all have a beautiful day and an even better week ahead. 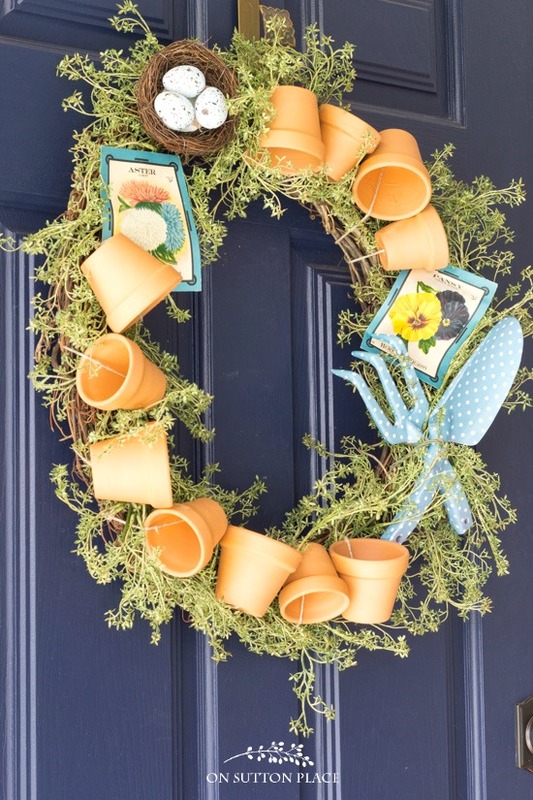 More inspiration for your front door! Love this wreath, it is just so cute! I have been traveling South For weeks to get away from the cold. I will be heading home in about two weeks and I will be heading to Hobby Lobby! I’m totally over the cold weather. And exactly why did it wait until Spring to snow in Ohio?! Seriously, though, I love the wreath! Thanks for sharing yet another fantastic tutorial! Ann! I absolutely adore this darling wreath! It’s so bright and sunny looking. Now, I have copied (tried to) a couple of your wreaths in the past, (last Fall’s wreath was my best) but I know I could NOT master this one! You have such talent and are so creative, you are blessed! The wreath looks very cute, thanks for sharing. Thanks Ann have a great day. Oh Ann…this is so adorable! I’m loving these little pots!!! About that snow! I woke yesterday to the sound of snow plows coming down our street???? I couldn’t believe it! Gotta love Ohio???? I now what you mean we have snow here too and Im over it. I also want to clean up my porch but I’ll be sweeping snow off instead of dust. Im so ready to plant my flower boxes but there won’t be any chance of that anytime soon. My door also looks like spring and looks out of place with all the snow on the ground. I’m loving your tiny terra cotta pots they’re adorable. Pinning! So glad to see you “moving ahead”. The weather here in NW Indiana is finally supposed to improve by next weekend so your idea is timely! I like this fresh idea for a wreath. Mine would hang on the siding of the garage near my secret garden!